Press Release of the 4th Shaheed Nanak Singh Memorial Lecture at Punjabi University, Patiala. 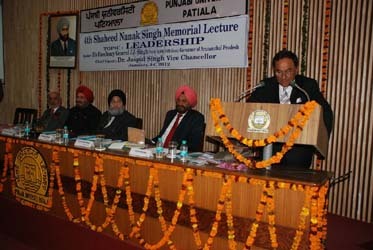 The Fourth Shaheed Nanak Singh Memorial Lecture on Leadership was delivered by His Excellency General J.J. Singh (Retd. ), Former Chief of the Indian Army, Governor of Arunachal Pradesh, India on Saturday 14th January 2012 at the Punjabi University, Patiala. Distinguished guests from India, Pakistan, USA, UK and Canada were amongst the audience. Speakers also included British Parliamentarians, Lord Rana of Malone, Lord Sheikh of Cornhill, Mr Tony Baldry MP, Mr Richard Harrington MP and Mr Paul Uppal MP, Mr Mukesh Anand, Chairman of the Shaheed Nanak Singh Foundation, India, Mr Tahir Ali, CEO Venus TV UK and Mr Arif Chaudhry, Chairman of the Pakistan and India Friendship Society, Pakistan. 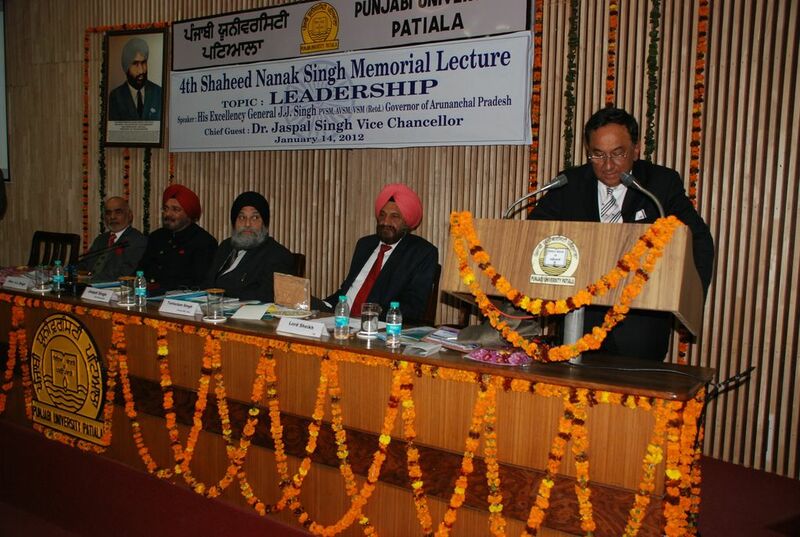 Prof Baltej Singh Mann, Head of the Sri Guru Tegh Bahadur National Integration Chair, welcomed the guests and stressed the importance of the lecture. 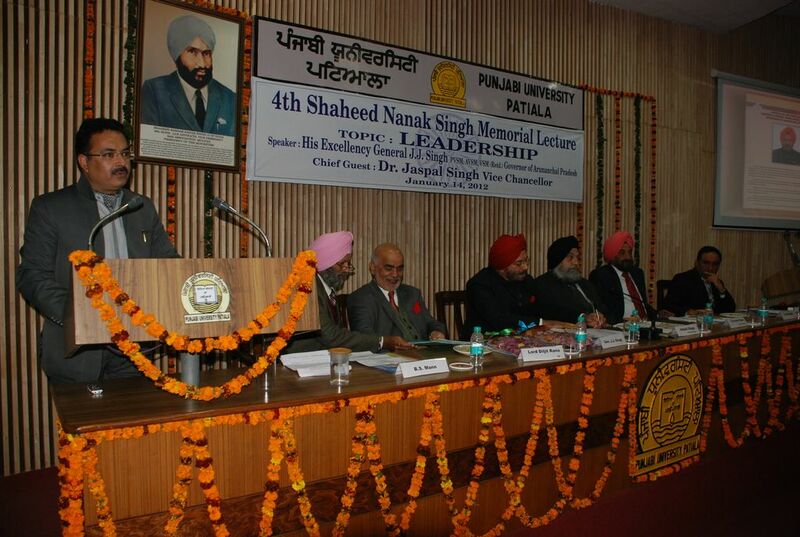 Dr. Jaspal Singh, Vice-Chancellor of the Punjabi University honoured all dignitaries with Shaheed Nanak Singh mementos to mark this historic day. The Introduction to Gen. J.J. Singh was given by Dr. Kamal Kinger, Head of Department for Defence Studies. He describe Gen. J. J. Singh as a great General who led his soldiers from the front and distinguished himself as a leader in every way. 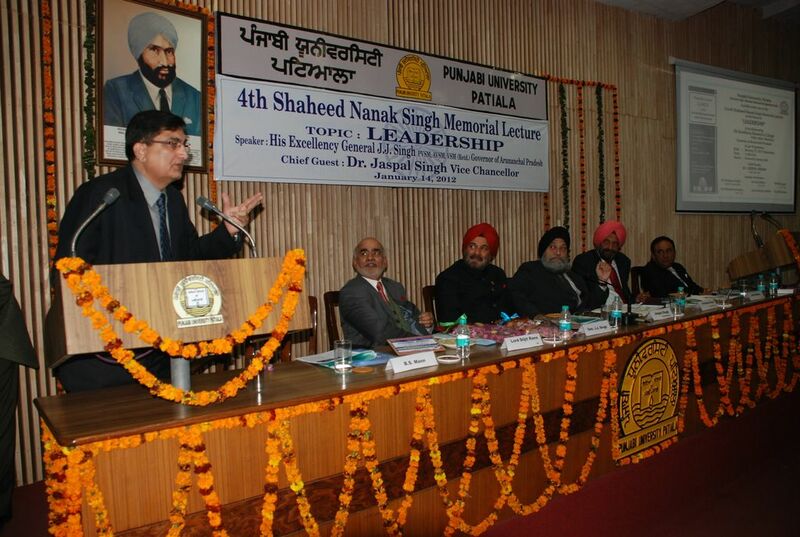 In a very inspirational lecture Gen. Singh spoke about leadership qualities that help build a great nation. He spoke of the Gurbani and other religious manuscripts being a great source of inspiration. He added that a strong will and transparency in work help us to develop leadership qualities. He stated that genes play an important role in the formation of a great leader. However, growth in wisdom plays a catalytic role in the formation of a great leader. 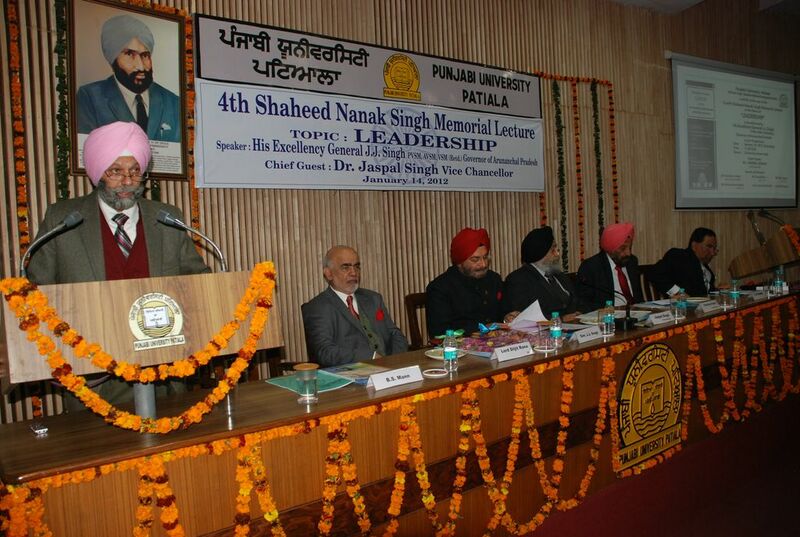 He paid tribute to Shaheed Nanak Singh who paid the ultimate price for India’s unity. He showed courage and leadership at a time when it was most needed. Tragically, he was killed while trying to save students of DAV School, Multan who were caught up in communal riots. The students were saved but he lost his life for the sake of Hindu Muslim unity. He said that we need more leaders like Shaheed Nanak Singh to advocate racial and religious harmony in this fractured world. 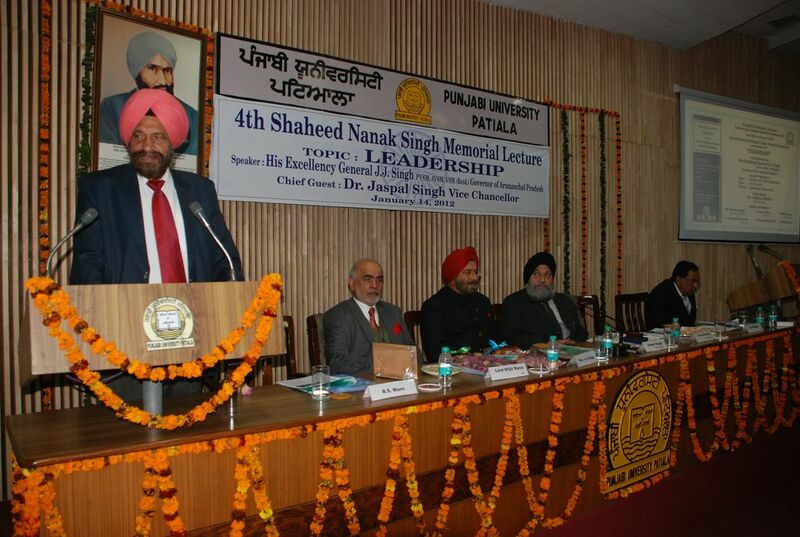 Whilst addressing the guests, the former Rajya Sabha MP and Chairman of the National Commission for Minorities, Dr. Tarlochan Singh, said that the martyrdom of Shaheed Nanak Singh was in the cause of saving innocent lives. Only a true leader can put the interest of others above his personal safety. He also paid tribute to the widow of Shaheed Nanak Singh, Mrs. Harbans Kaur who brought up 8 children singlehandedly having lost her country, ancestral home and above all, love of her life. She epitomized the spirit of Mother India. Mr Arif Chaudhry, President of the Pakistan, India Friendship Society, who came specially from Pakistan, stressed the need for friendship between the two countries for the greater good of their people. He also pressed upon the need to develop the Punjabi language in Pakistan and confirmed that the opening of a Punjabi University in Nankana Sahib, the land of the founder of the Sikh faith, Guru Nanak Dev Ji, is in process. He added that the Punjabi language will strengthen old bonds between Punjabis of the world. 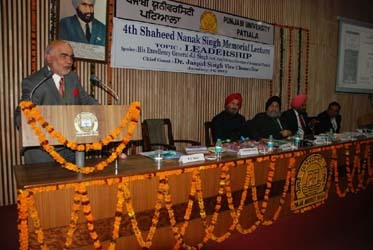 British Parliamentarian Lord Rana said Shaheed Nanak Singh was a visionary who warned against breaking up India on the basis of religion. We are all first and foremost Indians regardless. The role of religion is to unite and not divide mankind. He hoped that the people of India and Pakistan will learn from the lessons of Ireland where harmony has now returned after tumultuous times. Lord Sheikh of Cornhill also paid tribute to Shaheed Nanak Singh for his love for every Indian regardless of their religion. He spoke about similarities in religions and how each one teaches us to love one another. We must celebrate what unites us rather than what little divide us. 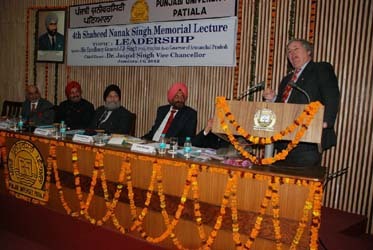 Mr Tony Baldry MP also paid tribute to Shaheed Nanak Singh who stood for the unity of India. He was honoured to be amongst those who had come specially to pay tribute to the Shaheed. 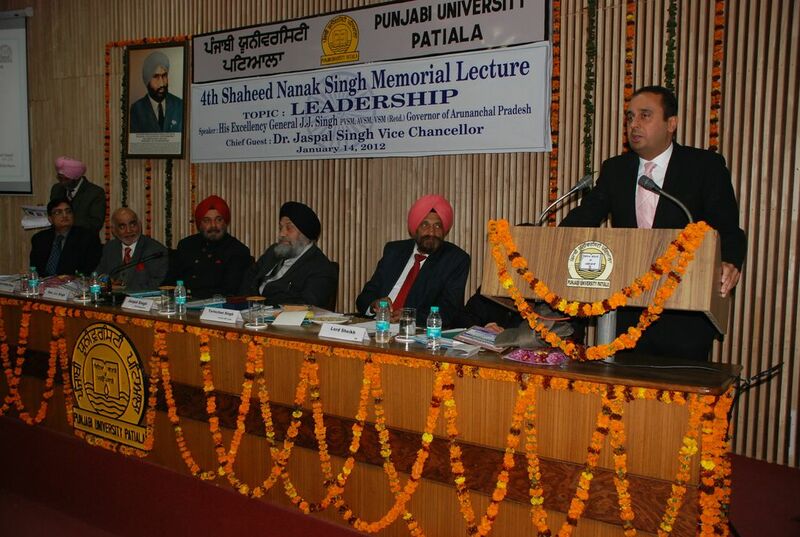 Mr Paul Uppal MP, the first Sikh MP in the Conservative Party was honoured to know the family of Shaheed Nanak Singh. He too was moved by the love of the Shaheed for his country. 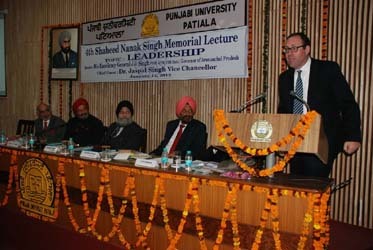 Mr Richard Harrington MP addressed the gathering and said it was heartening to see people from many countries and of every religion paying tribute to Shaheed Nanak Singh who sacrificed his life for what he believed in, unity of India above else. 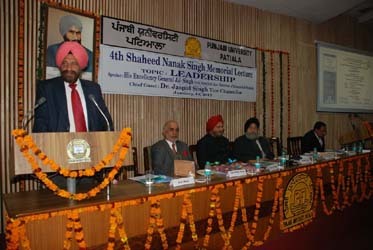 Dr. Jaspal Singh, Vice-Chancellor of the Punjabi University in his Presidential address said that great leaders have always influenced society and have been instrumental in changing the social system. The quality of leadership has forever steered all nations from darkness into light. He further added that to make the future of India better, the present leadership should work honestly, transparently and devotedly. 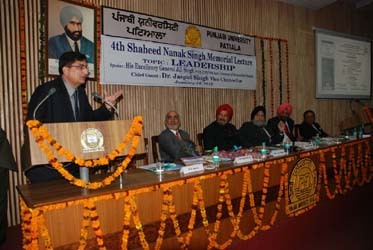 He said that we must embrace Shaheed Nanak Singh’s ideals of religious tolerance and peaceful coexistence for a civil society. We either live in harmony or consume ourselves in hatred, simply in the name of religion. The Indian National anthem was then played and afterwards the guests were provided with lunch. The Shaheed Nanak Singh Foundation Hosts Dinner at the Shangri-La's Hotel, New Delhi, India. Please click below to view the video presentation. 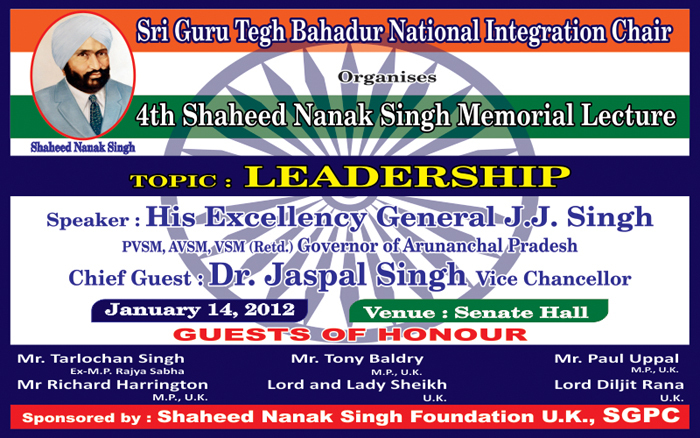 His Excellency General J.J. Singh (Retd. ), Governor of Arunachal Pradesh being given the Guard of Honour. Prof. Baltej Singh Mann, Head of the Sri Guru Tegh Bahadur National Integration Chair welcoming guests. Dr. Kamal Kinger, Head of Department for Defence Studies introducing His Excellency General J.J. Singh (Retd. ), Governor of Arunachal Pradesh His Excellency General J.J. Singh (Retd. ), Governor of Arunachal Pradesh delivering his inspirational lecture. 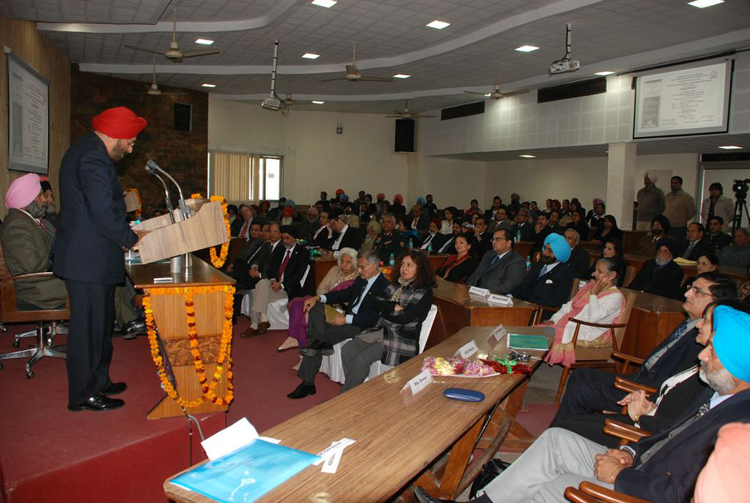 Guests listening to His Excellency General J.J. Singh (Retd. ), Governor of Arunachal Pradesh’s lecture. Lord Rana of Malone, Member of the British House of Lords, talking to guests. Lord Sheikh of Cornhill, Member of the British House of Lords, addressing guests. Mr Tony Baldry MP, British Member of Parliament for Banbury, addressing guests. Mr Paul Uppal MP, British Member of Parliament for Wolverhampton South West, talking to guests. Mr Richard Harrington MP, British Member of Parliament for Watford, speaking to guests. 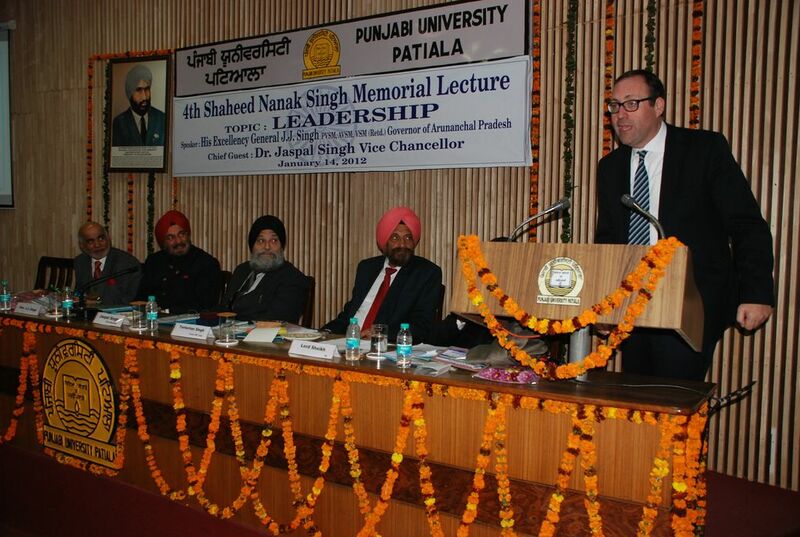 Dr. Jaspal Singh, Vice-Chancellor of the Punjabi University making his Presidential address. Dignitaries with Mementos of the 4th Shaheed Nanak Singh Memorial Lecture. Dignitaries with the family of Shaheed Nanak Singh.